Nowadays, everybody wants to expand their empire. The Austin-based production company Rooster Teeth has achieved unprecedented success in the world of machinima, or films created using video-game environments. Its popular Red Vs. Blue shorts, launched in 2003 and still going strong, now constitute the longest-running web series of all time. But why stop there? Especially since having a loyal fan base makes diversification relatively easy. 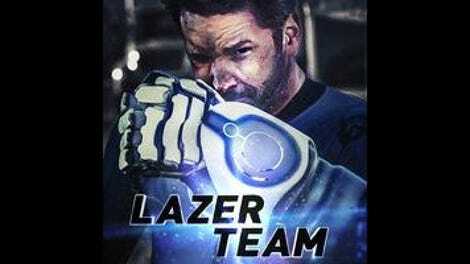 When Rooster Teeth announced plans to make its first theatrical feature, Lazer Team, and turned to Indiegogo to raise the cash, diehards immediately coughed up $2.4 million. Whether a broader audience will turn up for this goofy sci-fi comedy, starring a no-name (for the general public) ensemble that’s primarily done voice work in the past, remains an open question. But it does at least look like a real movie, albeit one with a script that’s been recycled from dozens of previous low-rent pictures about a group of scrappy underdogs who band together to save the world. A swift prologue establishes the backstory: The famous “Wow! signal,” discovered in 1977, is revealed here to have been a communication from an alien species, which warned mankind of an impending invasion and promised to send a “suit of power” that would allow a human champion to protect Earth. The U.S. government subsequently spent decades grooming an elite super-athlete (Alan Ritchson), preparing him for the day when the suit would finally arrive. Instead, the incoming spacecraft accidentally gets shot down by a couple of drunken idiots (Gavin Free, Colton Dunn) setting off illegal fireworks, and they, along with a small-town sheriff’s deputy (Rooster Teeth founder Burnie Burns) and the high-school quarterback (Michael Jones) who happens to be in the back of his squad car, discover the suit amidst the wreckage. When each dons a piece of it—there’s a brain-augmenting helmet, two armpieces (one shoots a laser, the other generates a shield), and a pair of super-speed boots—genetic links render them unremovable. Instead of one highly trained champion, then, Earth must depend on the coordinated efforts of these four dolts, dubbed “Lazer Team” on Instagram by the not-so-literate jock.